Gearworks spawn of this item seems to be buggy as off the current build. Useful while harvesting ore in your mine since moving around goes faster this way, alongside the use of Minenarbeiterkaffee. It can be used in instances, thus it's a great item for tanks without charge-like ability to start battle with trash packs. You can't aim it at mobs like you can charge, but it only takes a few pulls to figure out the distance you need to stand at to get the same effect. The item lasts for 2x10 minutes, which is enough for an average 5-man run. It would also be great for some melee specs, since it saves you a couple seconds running to the mobs after the tank attacked them. However it's less beneficial for some specs like ferals, who benefit from opening from stealth. Note that if you want exact control over where you will land, you need to use it while standing still, since if you try using it while running, the position server thinks you used it from is affected by lag, which makes the landing spot somewhat unpredictable. Every time you get a new stack(use one charge, delete it and re-get it) of these and use it, you get a new buff. Good for quick traversal, not so good for actual combat purposes. It's hard to aim, if you can even call it possible. For example: I had a follower with me while I was picking herbs from the garrison garden, and when a podling spawned, the follower taunted it. So the podling was completely stationary. I tried multiple times to hit the podling with the jetpack jump, but I kept just flying over its head in both directions. Even if I adjusted my distance, I still soared straight over it. As has been stated in the comments, you can use this while mounted. So this is really good for quicker travel. The jetpack while mounted is letting me phase through the outside mountainside of the horde garrison. It seems like it spots where there is only one layer you can pass through when you jump. If you jump deep enough into the mountain in 2 or 3 spots you can fall off the world. I have confirmed it with some screenshots. this thing is ridiculous for casters in world pvp. Just fought a priest as a rogue and died 3 times without getting him to 80% health. If you are trying to complete the Terrific Technology requirement, you have to re-equip your jet-pack after every use. Terrific Technology is found under Achievement Points/Garrisons/Buildings. Merely have your backpack open to the jet-pack, perform your attack, click on the jet-pack in your backpack to re-equip and attack again. Repeat as necessary to fulfill the 10 required uses. This means that you will have to make four trips to the Gnomish Gearworks to pickup more jet-packs. Have fun. I was surprised to discover this works outside of Draenor. I suppose I shouldn't have been, since there doesn't seem to be any such prohibition documented in to tooltip. 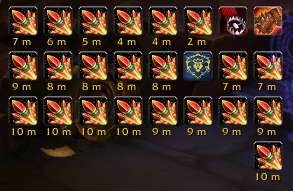 I guess I'm just too used to Draenor goodies being Draenor-only. Hilarious when used while riding a ground mount. Rocket-propelled mechanostriders anyone? Does not stacks with Fel Lotus. Sadly. No longer works outside of Draenor. In fact if you have it on and leave it will vanish. "Vorsicht: Vom Gesicht weg zielen."